I get a lot of emails and questions from readers asking for blog advice. I love to share what I know with others but I never was able to find enough time to give one-on-one support. There's so many topics to talk about and so many important details that an email was never enough. One summer, I finally decided to write a blogging ecourse, sharing everything I know about blogging. It took a very long time to get it all down and organized in one place but I was so proud to finally finish it!! 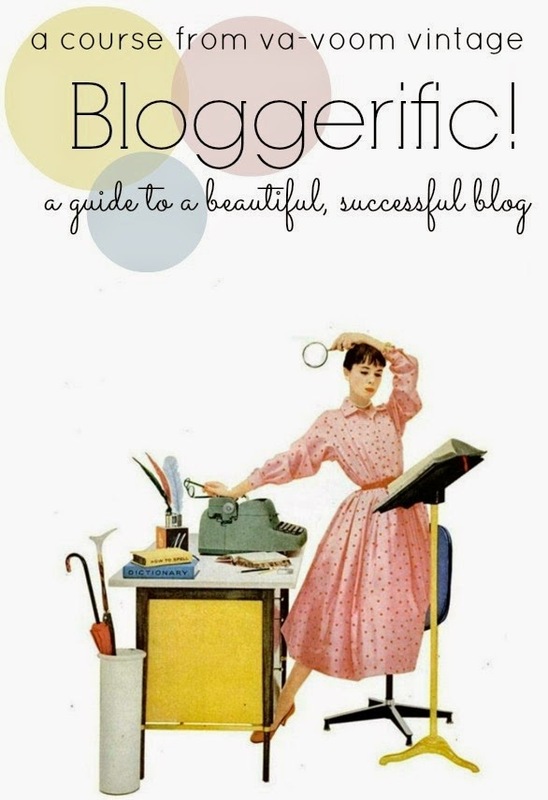 Bloggerific: A Guide to a Beautiful Successful Blog is now on sale for $10 off!! This ecourse is in blog format. The categories are organized on the sidebar and each article is in a blog post. Once you purchase, it's yours to keep forever so you can go back and read through tutorials and tips as you need it. Take a peek! Bloggerific covers everything that I have learned in my almost 5 years of blogging. I talk about how to never run out of post topics, how to design your own blog from scratch using free programs and even how to make money blogging. 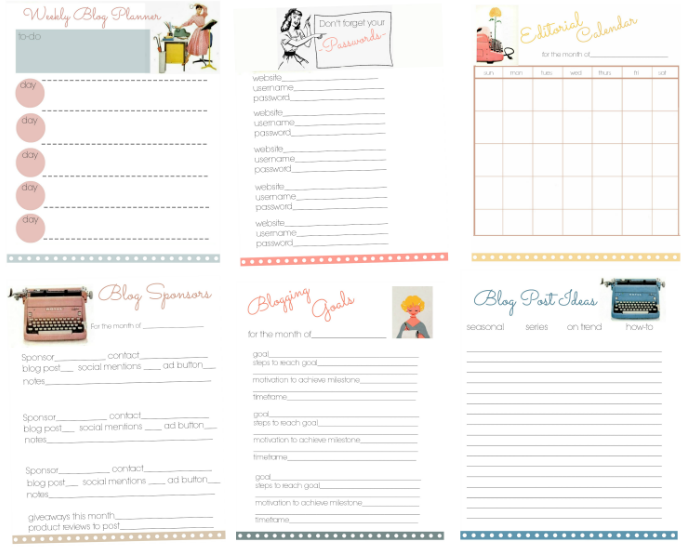 This course also includes a set of retro styled printables that I designed to keep you organized. Stick them in your blog binder to keep track of blog posts, sponsors and all of that fun stuff. Writing Tips and SEO Optimize your posts and blog design and build relevant links all over the web to increase your traffic. With these writing and brain storming tips, you'll always have a pile of great blog post ideas. 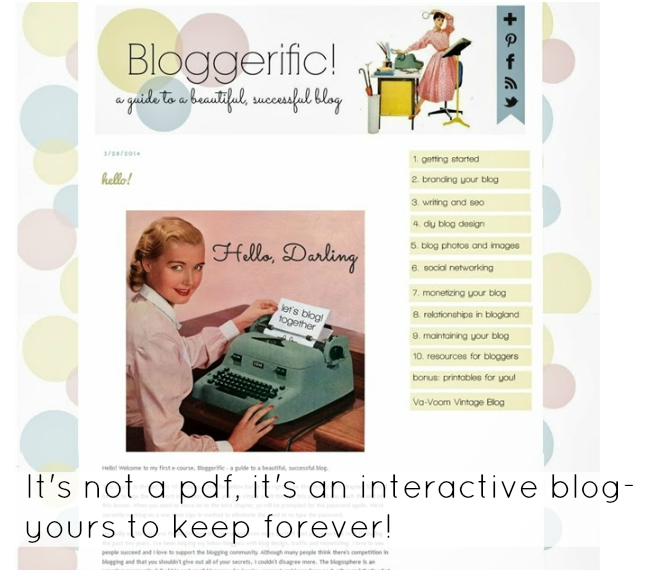 DIY Blog Design 12 step by step tutorials to design your own beautiful blog. These tutorials are written for Blogger users. Blog Photos and Images Learn to find images that you can legally use on your blog, take your own gorgeous photos and make all of your blog images look great. Social Networking Build a following on social sites to increase traffic to your blog with time management ideas so you can spend more time creating and having fun and less time promoting. Make Money Blogging Everything I know about how to legitimately make money doing what you love including creative ideas to monetize, how to find sponsors and how to build and use a media kit. Building Relationships Form life long friendships, important business relationships and the smart way to deal with negativity in the blog world. Tools and Resources A list of over 50 wonderful online tools and resources to fuel your creativity and help your blog run smoothly. I am so excited about this. I have wanted to purchase your ecourse for a while now, but as I am on a very fixed income so I haven't been able to. Thank you very much for having a sale, I can't wait to start the course. I purchased it and am having a bit of difficulty accessing the page, I'll email you at the address above.